Relationships, career, money, where they belong, and what they are here to do. All of these things are related…related to one thing F.E.A.R. I saw this quote online this week and it created one of those AHA moments for me. 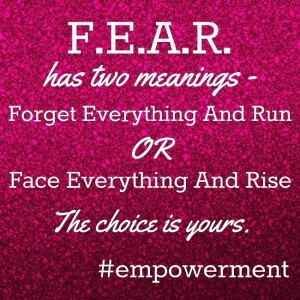 There are two meanings to F.E.A.R. Many of us are inclined to do the first when we come across something challenging in our lives: We Forget Everything and RUN! It seems to be the easier of the two…run from day to day responsibilities, run from the underlying issue, run from our emotions, run from our truth. But is it really easier? Running from our truth, how we really feel about something, actually causes more dis-tress. It causes physical illnesses and emotional diseases because we suppress who we really are and what we really want for the sake of keeping the peace or doing what others tell us we need to do. Many times our relationships become more strained because our underlying feelings are not in line with how we are expressing ourselves. Tension and stress rises dramatically. Truly, the easier in the long run is to Face Everything and Rise. I can hear you saying, “yeah, right”. But think about it. It does take courage to face your fears and that courage is sometimes difficult to muster, agreed. But the long-term outcome from facing your fears and rising to your inner truth is empowerment. 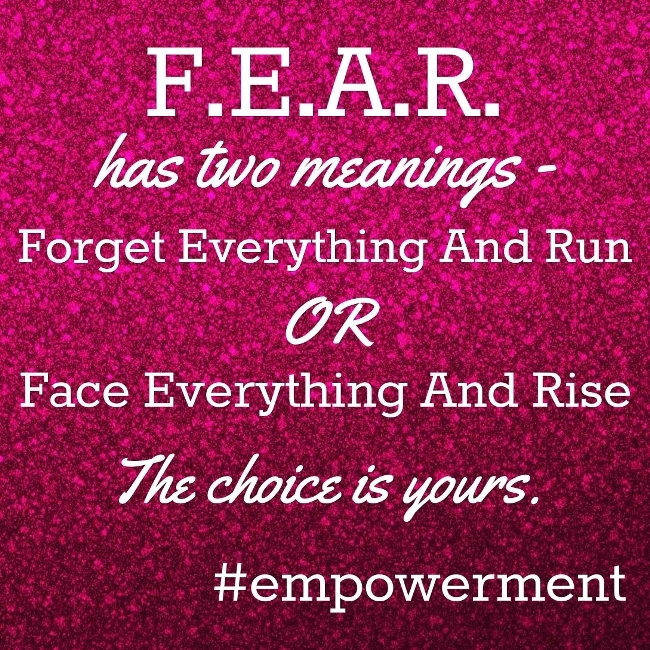 That empowerment then grows exponentially and the courage to rise against fear becomes easier. Life around you changes. Some things may need to change: relationships, career, but the change is more in-line with our true self. Once inline, stress reduces, tension reduces, dis-ease reduces. We become healthier and happier. I’m not saying that life will be a bed of roses, but by facing your fears…YOU are in control, not someone else. YOU. And that’s where the second AHA happened…The Choice is Yours! 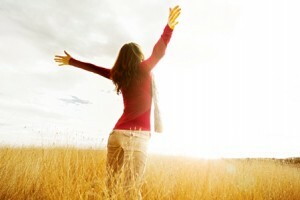 Becoming empowered….knowing you are free to make the choice, enhances the quality of your life in so many ways. You are not bound by other’s opinions or choices. You are free to enjoy the choices you make in your life. True…you could make a bad choice and things not turn out the way you would have liked, but the good news is you are free to make another choice to change that. You have the power and the choice to live the life that you want. Break free from the bindings and cage of fear and fly free in your own power and truth.